For those unfamiliar with British slang, the word ‘supergrass’ was a media invented term for a Premier league police informer. It appeared in the early 70s as part of the circus around some high-profile trials of underworld figures. For folk who don’t know the British band Supergrass, they were formed in 1994. Their first album appeared the following year and was greeted with that rarest and most sought after of doubles: both popular and critical success. Four is the number of their 2002 album Life On Other Planets. It is a corker from start to finish; full of energy and great songs. Vinyl Connection has their complete catalogue on CD but a lack of the black stuff ain’t gonna stop this spur of the moment appreciation of a funny, sparkling, all-round ripper of an album. For those concerned with matters of blog etiquette, Vinyl Connection is certainly not trying to muscle onto the patch of Kamertunes. 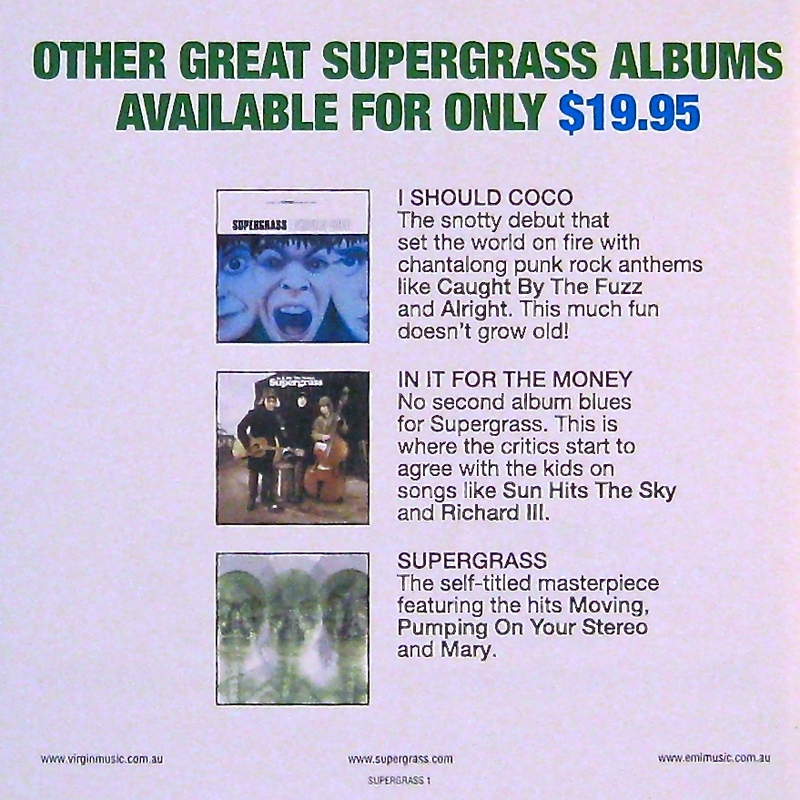 Rich recently posted a review of the first two Supergrass albums as part of one of his thorough re-visitings of an artist’s catalogue. Don’t even think of not reading his next instalment or the fuzz will be round banging on your door, mush. Fortunately I’m not reviewing the third album here. The blurb above claims it is a ‘masterpiece’. Objection, your honour! The defendant severely overstates the case. For influence spotters, you’ll be in heaven. T-Rex (‘Seen the light’), early Roxy Music, Bowie/Lou Reed (‘Funniest thing’), even a touch of Pink Floyd on the closing song (‘Run’). Some of the Kinks tropes from the earlier albums have survived (‘Evening of the day’), but here we are more 70s than 60s. More glam than paisley. Having said that, there are still spikes of punky energy – ‘Never done nothing like that before’ screams like a 90s version of Buzzcocks. Form in the songs is classic but never tired. There are verses and choruses, guitars and some gorgeous analogue synth. Harmonies are tight but not over lush – we’re always closer to Small Faces than Beach Boys. Four listens to this disc and you’ll be ranking it amongst your favourite 90s albums… perhaps even ‘all time’. Sure, the standout songs like ‘Grace’ and ‘Brecon Beacons’ (my favourite for its humour and Bolan blast) will still grab you after multiple listens, but so many other songs here are ‘sleepers’ that, my friends, you will undoubtedly be sentenced to life. Not on another planet nor in an English penitentiary but to a lifetime of rock riches fenced by the inimitable Supergrass. Listen to the McCartney/Wings song ‘Let ‘em in’. Now listen to ‘Prophet 15’. Am I the only one who can imagine a court case looming here? Me and the wife were soooo into this band around the millennium! Spin it again. Relive those halcyon days! Thanks for the shout-out, Bruce. This was an excellent write-up and for-tuitously timed (I enjoyed your “for/four” theme regarding their 4th album). Also, thanks for sharing that page from the Life On Other Planets pamphlet. As someone who has occasionally written blurbs about artists/albums for CD packaging & website, I always appreciate a well-written and hyperbole-filled sentence or two. I’ve revisited their 3rd & 4th albums as well as the Supergrass Is 10 compilation (which includes 2 new songs and a bonus live CD) this past week, and I hope to have my next post completed in the next couple of days. I might have a stronger feeling for their self-titled album than you do, as it is near “masterpiece” level for me. I still need to give them all one more listen and take detailed notes before making my final assessments. Cheers! I hope life is alright on your planet. A little while back, Mr 1537 and I attempted a ‘simultaneous’ post on Keith Jarrett’s Koln Concert. That was in the back of my mind when I dashed off the above post last night. It’ll be great to read a different and thoroughly considered view; hopefully others will enjoy the double-barrelled approach too! Nice one. It sounds like you listened to this album so much you wore it around under your skin. Hmm, if only there were some way to combine skin, with your for/four theme. I totally missed this LP, probably skint I’d imagine. Thanks for that editorial suggestion. Perhaps for the second edition. You could probably pick up a little silver version for little outlay – worth it I reckon. Would that be tremendous, wonderful scarce silver vinyl edition … or one of those ‘things’. Ah, you are the eternal optimist, Joe. A crappy plastic/foil thing, I’m afraid. If one has to be caught by the fuzz, getting sentenced to a lifetime of rock riches sounds like the way to go – no need for bail money then, save your money for the children! There ain’t no bail from rock jail, Mister! Excellent review. Really great to see love for Supergrass. Rich’s blog inspired me to get these albums on (CDs here, too) and I’ve really enjoyed them. They’ll never get old. What’s really fascinating, J, is that as I’ve been listening to the albums in order, there is this sense that they are getting older. Snotty teenager first, second starting to explore a bit of sophistication, third going for the fame and wealth, fourth a resurgence of creativity doing what WE want, fifth more reflective, considered, the onset of maturity. And tomorrow I’ll listen to #5! I’ve always noticed that “onset of maturity” in their discography, especially across the first three albums, but they never lost that rush of excitement that was there on their debut. A lot of bands mature but get boring. Not so with Supergrass. Was hoping to be done with my next post on their catalog today but work and the weather have conspired against me. Hopefully tomorrow. Looking forward to comparing notes. Me too! This has been fun, Rich. Thanks for setting it in motion with your first piece! And no. 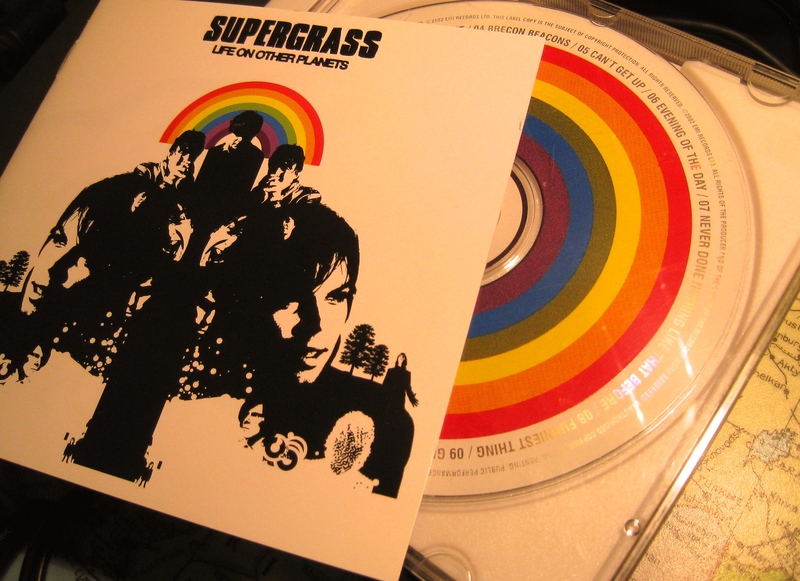 Super grass have managed to avoid ‘boring’; quite a feat over a substantial career. Yeah, I would definitely agree with that. I was not able to access VC whilst in China for the last two weeks – may be VC is perceived as a threaten to public morality or something like that. However I will listen to Supergrass this weekend with your comments in mind, now that I am back in Oz. Lovely to have you back on board DD. Hope the trip was pleasurable. I certainly found that this particular Supergrass album transcended the sum of its influences. Let me know what you make of it. PS. I’m sure VC is a threat to something, but I’m not sure it’s public morality. Maybe to boring music? OK. I wrote this guys down years ago and never followed through (I do that a lot). Now I guess i will have to seek it out because I trust you. Send back a report, CB!